Originally published under the title "Academic Malfeasance: Another Mangling of Views about Islam." 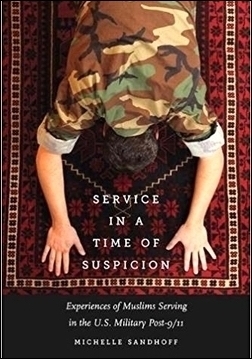 Michelle Sandhoff, an assistant professor of sociology at Indiana University of Pennsylvania, has written a book titled Service in a Time of Suspicion: Experiences of Muslims Serving in the U.S. Military Post-9/11 (Iowa City: University of Iowa Press, 2017). In it, she interviewed 15 Muslim service members who, according to the publisher, "talk about what it means to be Muslim, American, and a uniformed member of the armed services in the twenty-first century. These honest accounts remind us of our shared humanity." Among those who write and teach about Islam there are, broadly speaking, two camps. One side, exemplified by Karen Armstrong, presents a generally positive view of Islam and considers Islam to be a religion equivalent in scope and effect to other religions. At the other extreme are authors such as Daniel Pipes, who preach a doomsday scenario of an Islamic conspiracy to destroy the West. The latter camp often begin [sic] their discussion in terms of Islamism (a political movement), but quickly devolve into an association of all Muslims with fundamentalism, violence, and terrorism. This perspective takes the stance that Islam poses an existential threat; in his book Militant Islam Reaches America, Pipes writes, "The preservation of our existing order can no longer be taken for granted; it needs to be fought for." The form of this threat is often proposed to be "creeping sharia," the idea that religious accommodation and multiculturalism will lead inexorably to a world in which "sharia law" (i.e., Islamic law) dictates the behavior of both Muslims and non-Muslims. This perspective is also marked by the belief that all Muslims are suspect, and that profiling is a justified and effective technique to combat terrorism. Pipes writes, "All Muslims, unfortunately are suspect." Perhaps most troubling is the assertion from this camp that Muslims regularly practice taqiyyah, a form of deception believed by this camp to be pervasive. This allows them to dismiss any Muslim who speaks against them on the assumption that they are lying. Note that Armstrong just has views but I am at the extreme. I reject the idea of "an Islamic conspiracy to destroy the West." Conspiracy implies some central agent making plans, which does not exist. "Camp" is singular, so a camp begins. It's a good idea to get basic grammar right, especially when writing a book. I do not associate "all Muslims with fundamentalism, violence, and terrorism." To the contrary, I am known for saying that "radical Islam is the problem, moderate Islam is the solution" – and was quoted only yesterday to this effect in the Wall Street Journal. Nor is this view just an abstraction: I actively support anti-Islamist Muslims intellectually and financially. I do not use the term "creeping Sharia." I understand that taqiyyah is reserved for specific religious circumstances (such as Shi'a passing as Sunnis) and never deploy this concept to dismiss what Muslims say about Islamism. I recently wrote an article on 9 errors about me in 3 pages so, even by American academic standards, 4 mistakes in 1 paragraph is impressive; What's ahead, 2 errors in as many words? I keep wondering: are professors who disagree with me purposefully mangling my views or just not bothering to check what those are? Either way, the result undermines their only currency – a reputation for sound scholarship.